Water temps have cooled back down, enough to turn the striped bass back on. 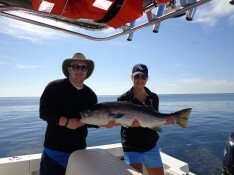 Mackerel are still plentiful, bluefish are showing up in small numbers, and stripers have been consistent. We have had some bigger fish showing up in the last week or so. We caught and released a nice tagged striper the other day, awaiting the info back on it. Looking forward to enjoying the rest of this nice weather stretch and striper bite.